The extremely agile machine benefits from a 12,000rpm 18.5kW spindle, designed to reduce machining cycle times for applications ranging from heavy-duty cutting to machining aluminium with small diameter tools. Direct drive ballscrews and roller linear guides also deliver high performance axis motion, with rapid feed-rates up to 42m/min in the X-, Y- and Z-axes. Designed and built at Mazak’s European Manufacturing facility in Worcester, UK, one of the features which sets the VTC-530C apart from other machines in its class is the inclusion of an Automatic Tool Changer with intermediate tool change arm. This allows for a capacity of 30 tools up to 350mm in length and 8kg in weight, and can deliver fast chip-to-chip times of just 4.4 seconds. Offering a generous X-axis stroke of 1,740mm, the VTC-530C is able to accommodate much larger workpieces than machines of a comparable footprint; expanding its potential customer base to include the likes of the oil and gas and aerospace sectors, as well as traditionally popular markets such as automotive and medical. However, it can also be configured to include an optional centre partition, which enables operators to simultaneously machine on one side, and pendulum load on the other, offering enhanced productivity. A fixed 2,300mm (L) x 530mm (W) table provides additional rigidity during the machining process, especially with heavy workpieces; while it also allows components to overhang if required, again adding further flexibility to the machine’s capacity. A slant bed casting has been integrated into the machine’s base to facilitate swift material removal – especially when cutting aluminium – as swarf is able to fall away from the cutting area. 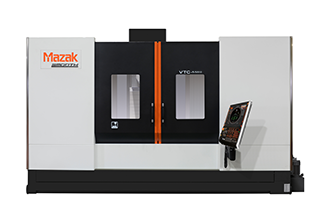 The VTC-530C is controlled by Mazak’s SmoothG CNC – the world’s fastest CNC – which not only contributes to improved cycle times, but can also reduce programming and set-up times.